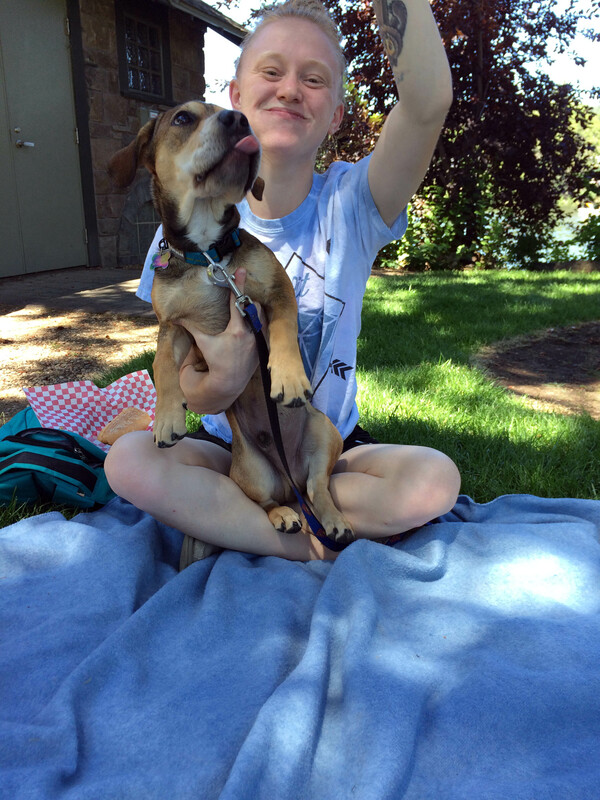 Dogs, bikes, hiking, and floating the river—a way of life that’s good. My Oregon vacation continues with several days in Bend. 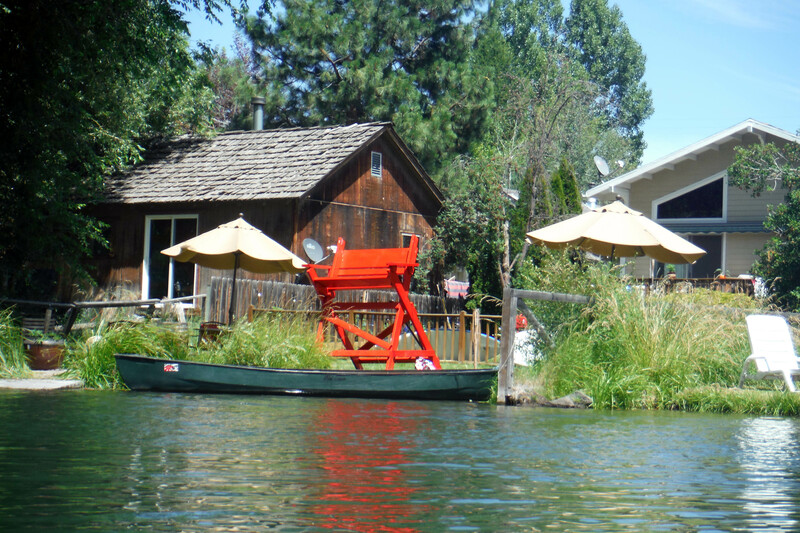 It is in central Oregon and while there is a substantial population it has a small town feel of a kind or resort town. There is a mix of expensive boutique stores, outdoor sports enthusiasts, and new age hippies. 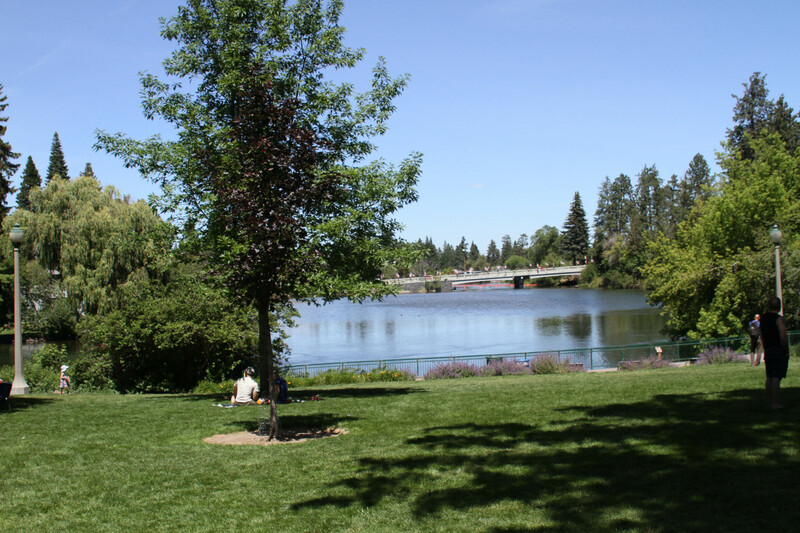 With beautiful snow-capped mountains surrounding a cute pedestrian friendly downtown, residents enjoy hanging out in the expansive park along the Deschutes river and sitting outside in café’s and trendy restaurants serving local food. Archer meets a new friend. 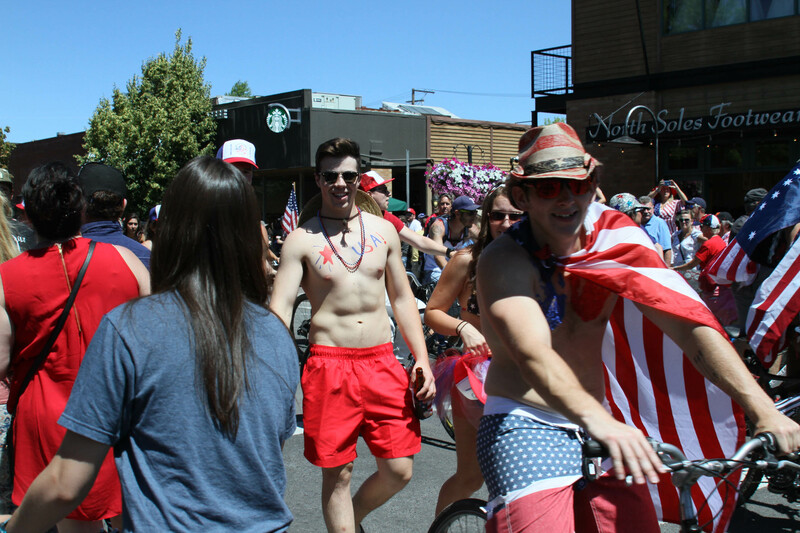 My adventure in Bend began in the morning of July 4 when we walked from my rented condo apartment into downtown to check out the first of several parades that day. These parades actually rival the infamous Horton Bay parades up in Michigan. The first parade was for dogs and other creatures. Dogs small and large were dressed up and walked or carried down the road. I was amazed at the number of them and then even more so when I spotted other creatures—chickens and roosters, miniature ponies, goats, horses, and bringing up the rear some large snakes. Archer gets lunch on July 4. We then headed down to Drake Park, a beautiful grassy area along the river filled with rows of retailers, artisans, and food tents. There were wonderful local businesses selling soaps, t-shirts, woodcarvings, dog products, recycled artwork, and much more. We gave McKenna her first taste of a delicious cheesesteak sandwich. It was the loveliest day and we enjoyed lunch on a blanket near the river in the shade of a warm sunny day. The girls’ dog Archer was a fan favorite—about a hundred people asked what kind of dog he was—some of them insisting on his combination of breeds even though they were wrong. 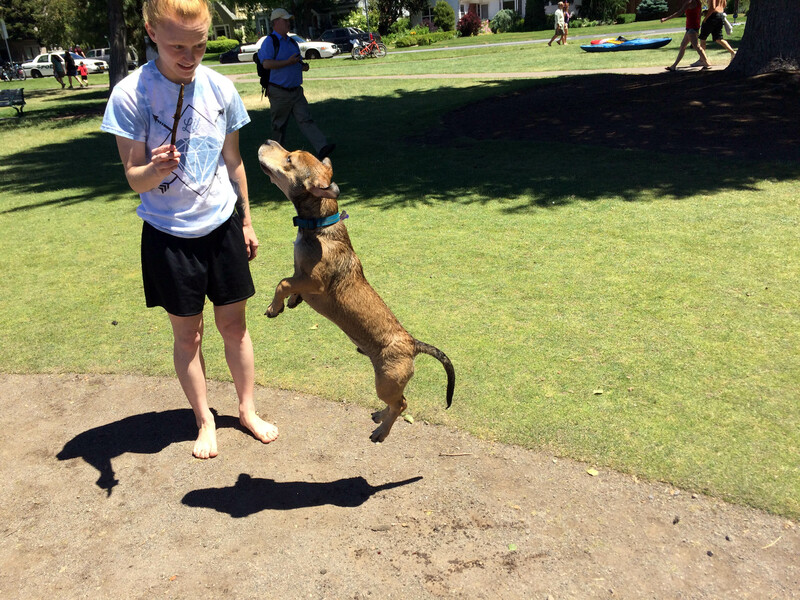 Archer is a funny looking and really cute guy—a lab, beagle mix. We took him over to the bank of the river to have a little swim. 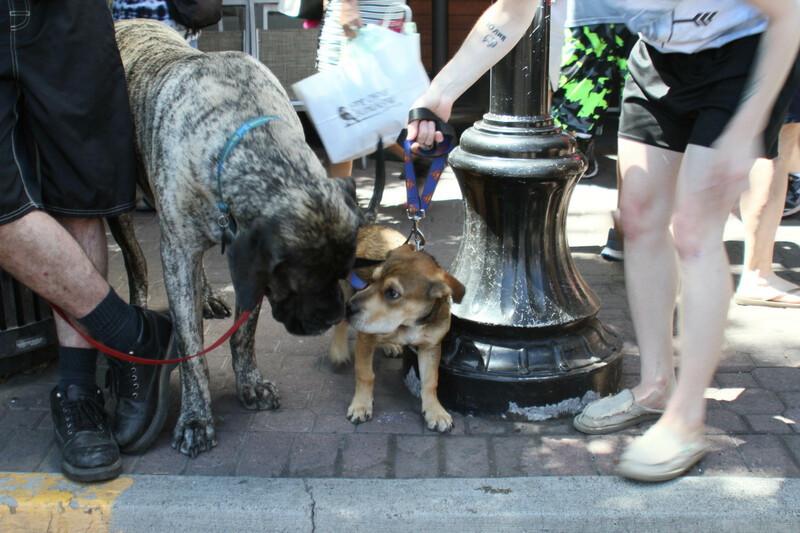 And he met many new friends, including a massive dog 10x his size. The endless bike parade. July 4 in Bend. It was then time for the bike parade which basically was several hundred people on various bikes coming down the street cheering loudly—many drunk and/or stoned and in the most colorful outfits. The people of the town were very friendly and in spite of the revelry pretty much orderly and kind. We spent the afternoon swimming and resting before meeting for a delicious dinner and fireworks. We went to a school under the Butte in Bend where they set off the fireworks and evidently with the dry climate, they inevitably set fire to the place. Some geniuses near us set fire to some brush with some of their own stash. A view of nearby mountains from the river as we floated. 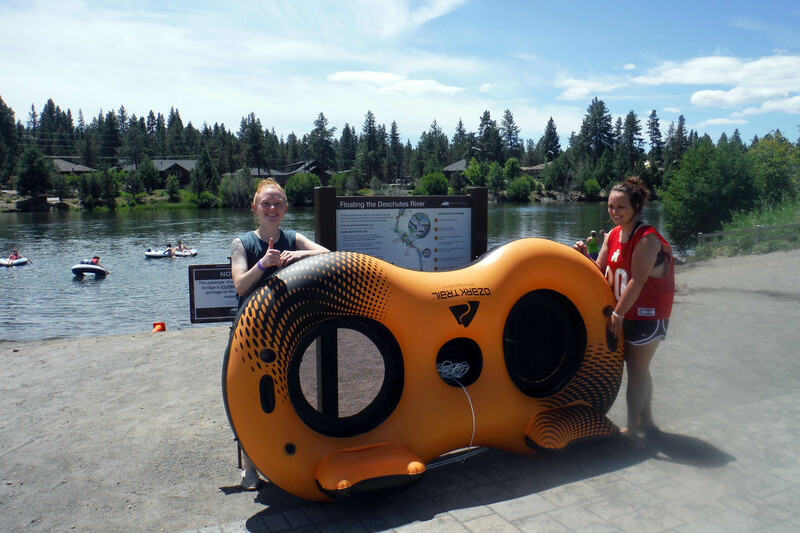 The next day we “floated the river.” The Deschutes river in Bend is very shallow (and cold) and it’s a daily activity for the residents to rent tubes (or many have their own) and enjoy the beauty of the surrounding area. We floated about an hour and passed by neat homes–some old and small and some newer and bigger. Many of them had cute decks and yards—one even had a bed. There were some rapids we bypassed and some random logs and such we sometimes missed and sometimes had to awkwardly maneuver around but the scenery was lovely the entire time—including some mountains, birds, and interesting people. We landed back at the park in town and caught a bus back. 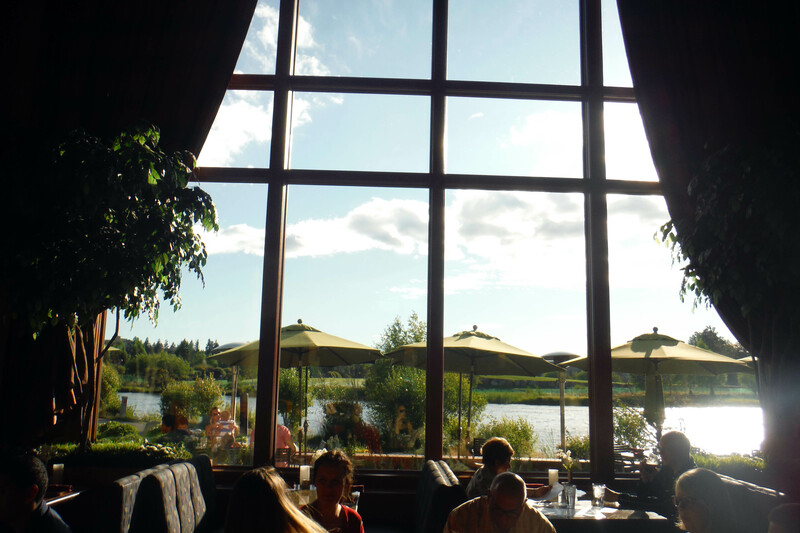 Our very fun day was topped off with another delicious dinner at Anthony’s—which had a wonderful view of the river. The food was mouthwatering and was made better by wonderful conversations and good company. The artwork around the restaurant was interesting. 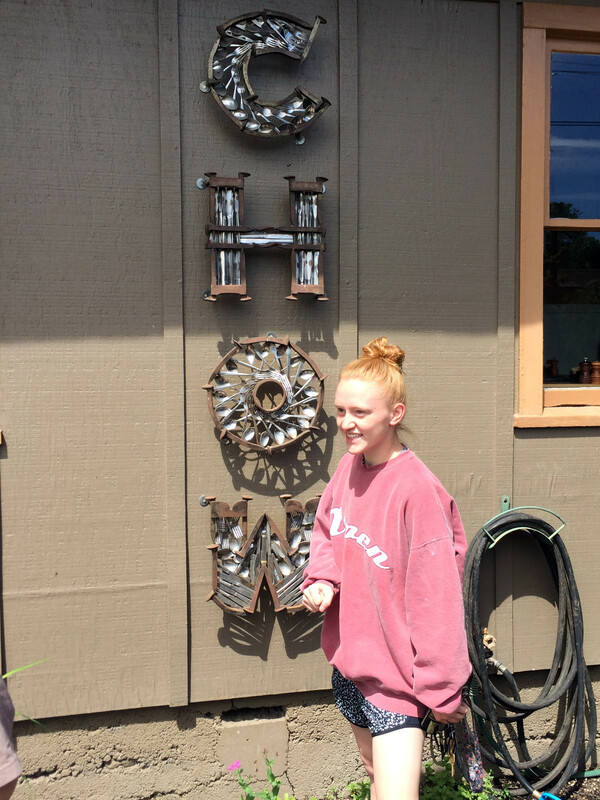 This sign was made up of silverware and railroad spikes. My last day in Bend continued with another delicious meal—brunch at Chow—an interesting place with local artwork placed around the house, and a garden where they grow some of the herbs and vegetables they use in their meals. We all had tasty mimosas and yummy eggs and such. We sat outside because the weather was once again warm and sunny. Dogs were welcome and we had more wonderful conversations before heading out to Bachelor Mountain. 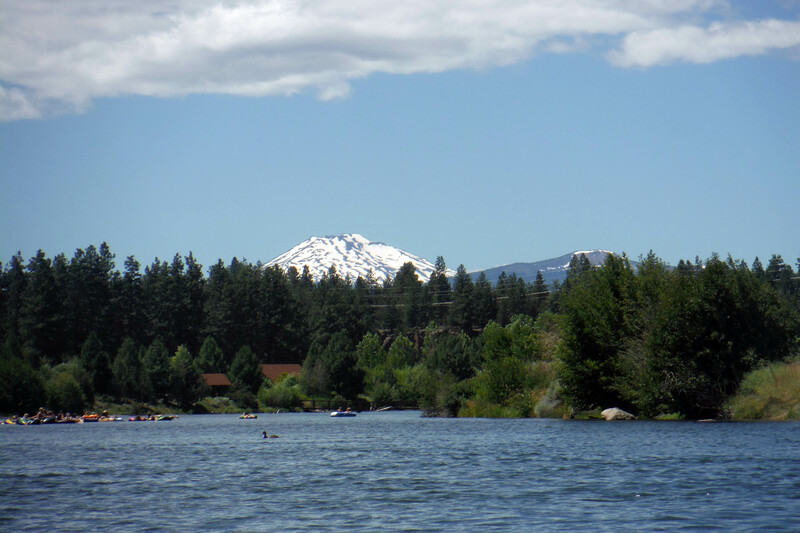 A short drive from Bend took us to the mountain where skiing is enjoyed in the winter and hiking and biking are prevalent in the summer. There was still a lot of snow on the ground so we couldn’t hike down, which was fine—we took the chair lift up and back and had wonderful views of the mountain ranges. 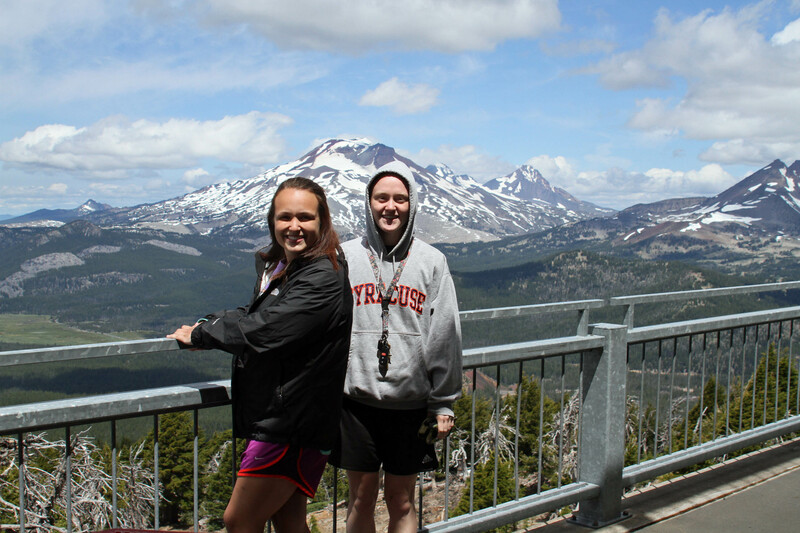 The Cascades were in the distance and close by were the Three Sisters and The Broken Top Mountain. Little lakes dotted the valleys in between them. We took a little hike around the top after lunch throwing snowballs and taking in the views. McKenna and Zenia atop Bachelor Mountain. The Three Sister s in the background. 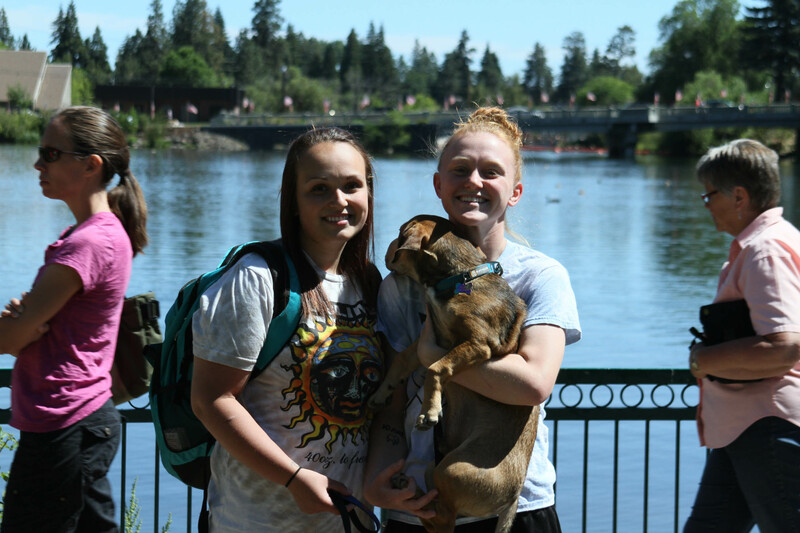 We spent some time exploring the shops and bookstores in Bend before I left for the south. We met some interesting people in town—a guy who set up a table with his small paintings and a book he wrote—about traveling around the west with mules. I can’t say I would be comfortable with his lifestyle but I really admire free souls like that who embrace life and nature. One of the wonderful gifts of traveling is meeting people who have such a different outlook and lifestyle as you—it gives you a new perspective of the world around you and makes you appreciate people much more. 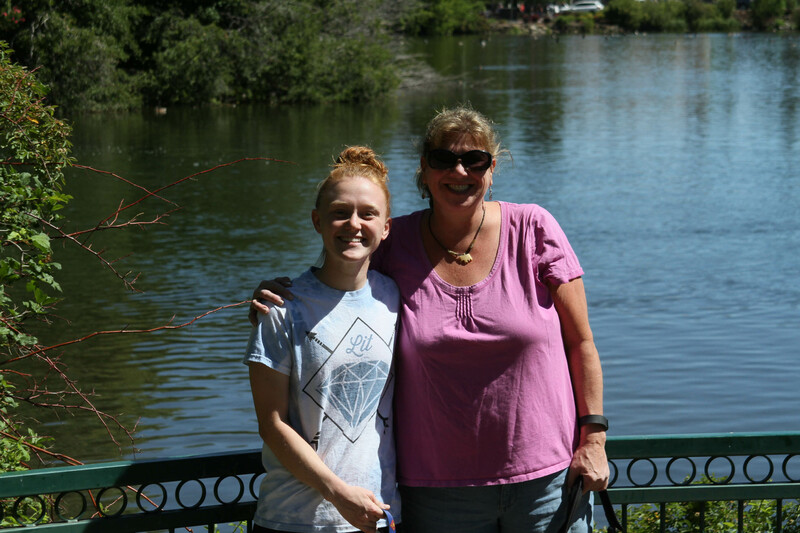 My niece and I on July 4 in the park in Bend. This was the best few days I’ve spent in a long time. 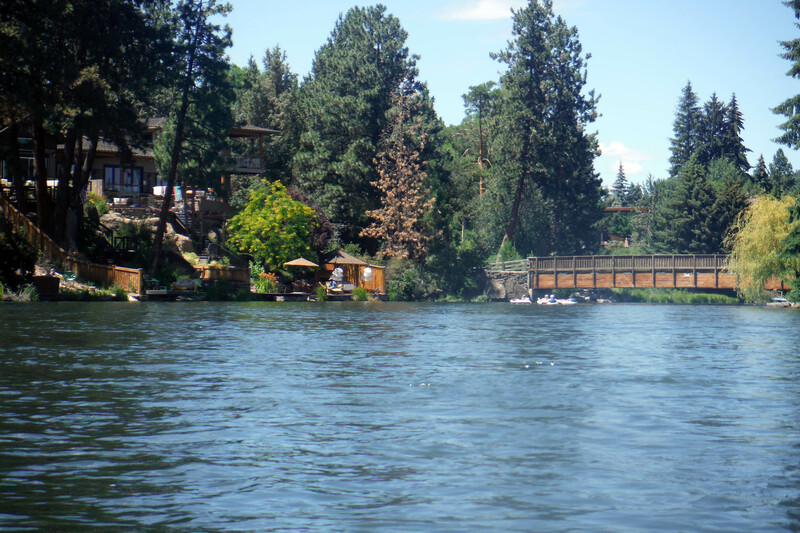 If I could live without working, I would rent a little place on the Deschutes River for a time each year and float on the river for some peace and rest. Next stop and post, Crater Lake. The view outside Anthony’s in Bend. 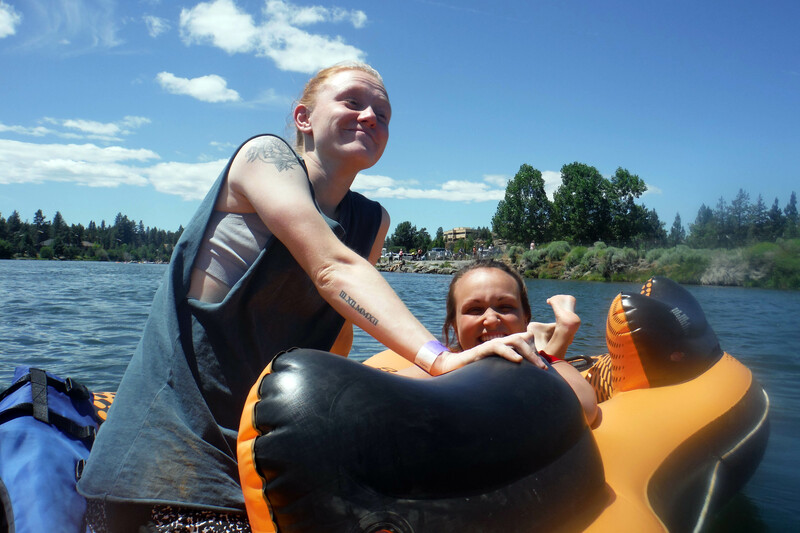 We floated the river there earlier that day. The houses on the river had the cutest yards like this one. 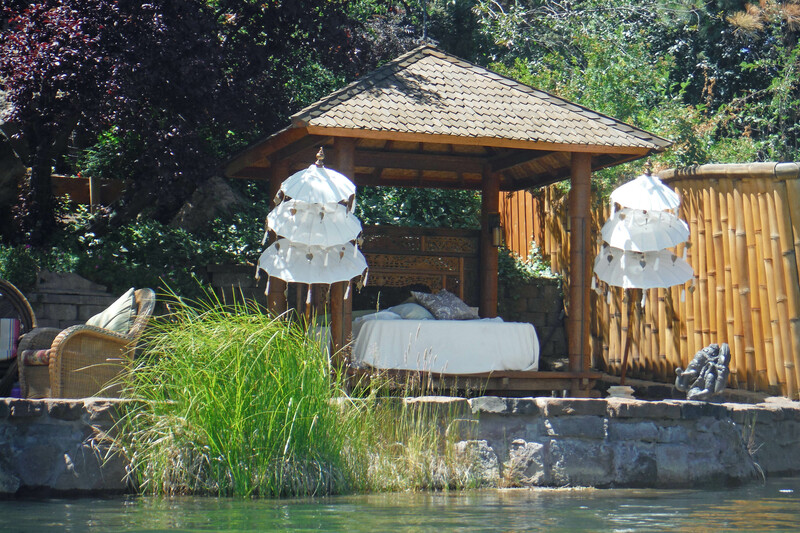 This house knows how to enjoy the comfort of the river with a bed under a canopy roof. 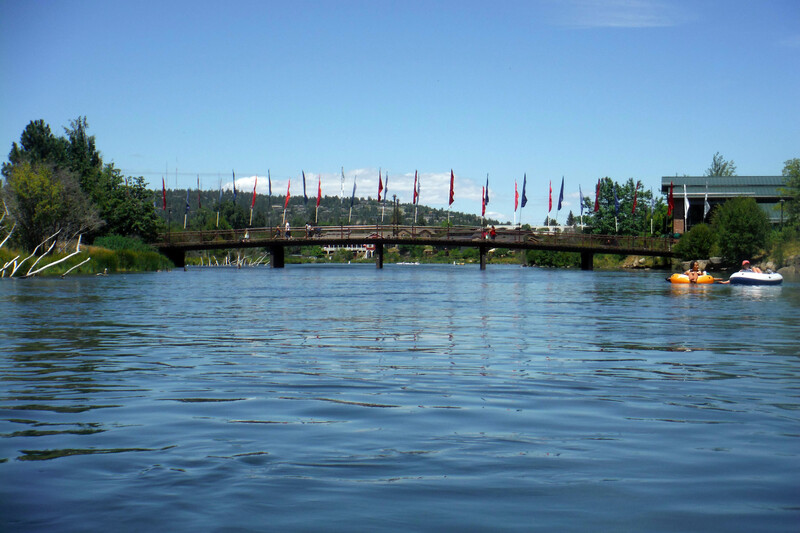 A view of the river as we floated along. 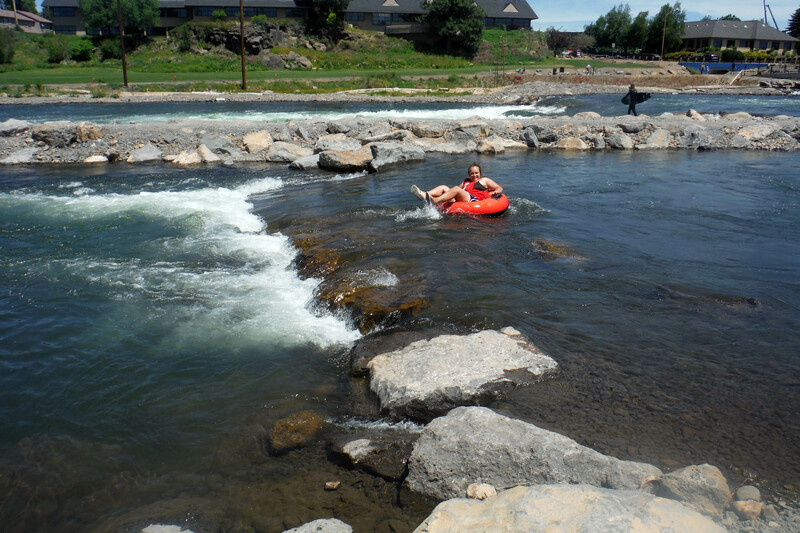 McKenna takes the rapids and ends up flipping over. 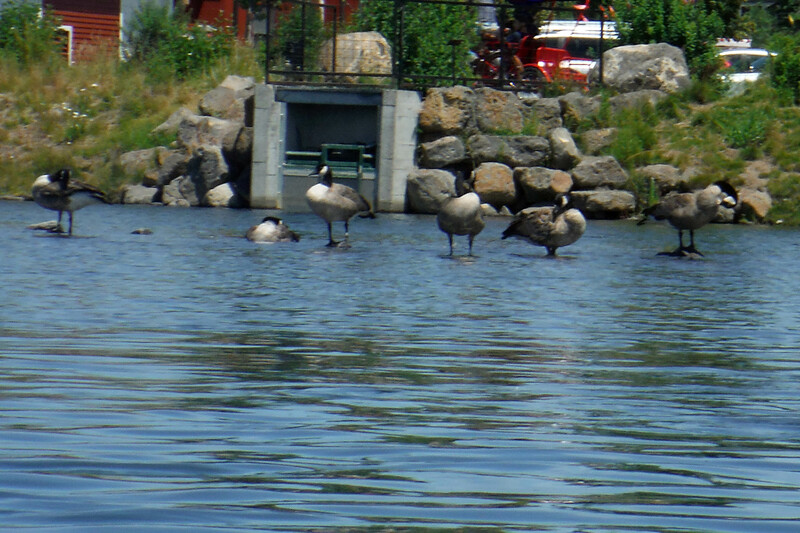 Lots of geese hang out on the river, some seem to walk on water and others were swimming alongside us.